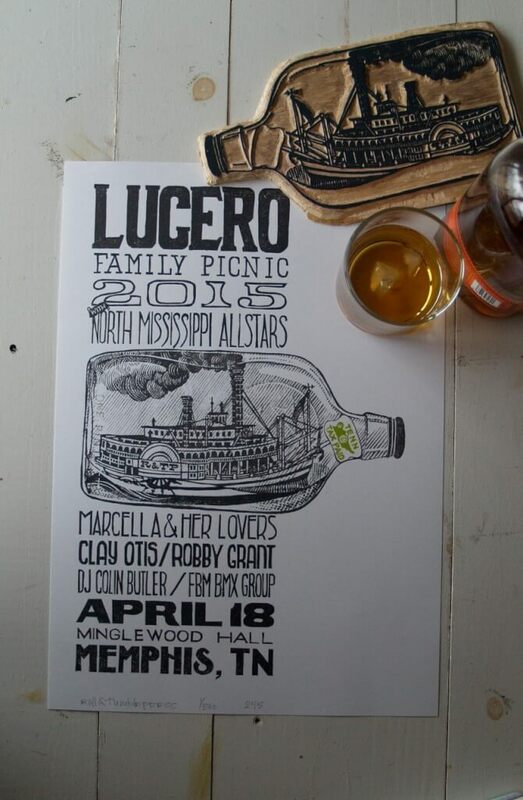 The great folks at Roll & Tumble Press designed the new poster for this year’s Family Picnic. We will be selling a limited quantity at the Picnic event!! These are unique because they are printed using a technique called Letterpress (Letterpress details below). The Family Picnic event will be an outdoor event held outside of the Minglewood Hall. Secure bike locks will be on site, so pedal on down!! Kids under 10 party for free! A portion of the ticket sales will be donated to Stax Music Academy. Letterpress printing is a technique of relief printing using a printing press. We lock up the carved wood block into the bed of a press, we then ink it, and hand crank the press, to transfer the ink from the block, which creates an impression on the paper. We print using traditional methods, creating all original illustrations, hand carving them into to wood and hand cranking them one a time.